Several terms redirect here. For other uses, see Town square (disambiguation), City square (disambiguation), Public Square (disambiguation) and Piazza (disambiguation). Red Square, in Moscow, Russia, a view from the northwest, showing historic St. Basil's Cathedral and the Spasskaya Tower or "Saviour Tower"
Most town squares are hardscapes suitable for open markets, concerts, political rallies, and other events that require firm ground. Being centrally located, town squares are usually surrounded by small shops such as bakeries, meat markets, cheese stores, and clothing stores. At their center is often a fountain, well, monument, or statue. Many of those with fountains are actually called fountain square. In urban planning, a city square or urban square is a planned open area in a city. In Mainland China, People's Square is a common designation for the central town square of modern Chinese cities, established as part of urban modernization within the last few decades. These squares are the site of government buildings, museums and other public buildings. The probably best-known and largest such square in China is Tienanmen Square. The German word for square is Platz, which also means "Place", and is a common term for central squares in German-speaking countries. These have been focal points of public life in towns and cities from the Middle Ages to today. Squares located opposite a Palace or Castle (German: Schloss) are commonly named Schlossplatz. Prominent Plätze include the Alexanderplatz, Pariser Platz and Potsdamer Platz in Berlin, Heldenplatz in Vienna, and the Königsplatz in Munich. "Piazza" redirects here. For other uses, see Piazza (disambiguation). A piazza (Italian pronunciation: [ˈpjattsa]) is a city square in Italy, Malta, along the Dalmatian coast and in surrounding regions. San Marco in Venice may be the worlds best known. The term is roughly equivalent to the Spanish plaza. In Ethiopia, it is used to refer to a part of a city. When the Earl of Bedford developed Covent Garden – the first private-venture public square built in London – his architect Inigo Jones surrounded it with arcades, in the Italian fashion. Talk about the piazza was connected in Londoners' minds not with the square as a whole, but with the arcades. A piazza is commonly found at the meeting of two or more streets. Most Italian cities have several piazzas with streets radiating from the center. Shops and other small businesses are found on piazzas as it is an ideal place to set up a business. Many metro stations and bus stops are found on piazzas as they are key point in a city. In Britain, piazza now generally refers to a paved open pedestrian space, without grass or planting, often in front of a significant building or shops. King's Cross station in London is to have a piazza as part of its redevelopment. The piazza will replace the existing 1970s concourse and allow the original 1850s façade to be seen again. There is a good example of a piazza in Scotswood at Newcastle College. In the United States, in the early 19th century, a piazza by further extension became a fanciful name for a colonnaded porch. Piazza was used by some, especially in the Boston area, to refer to a verandah or front porch of a house or apartment. A central square just off Gibraltar's Main Street, between the Parliament Building and the City Hall officially named John Mackintosh Square is colloquially referred to as The Piazza. A large open square common in villages, towns and cities of Indonesia is known as alun-alun. It is a Javanese term which in modern-day Indonesia refers to the two large open squares of kraton compounds. It is typically located adjacent a mosque or a palace. It is a place for public spectacles, court celebrations and general non-court entertainments. Naqsh-e Jahan Square, in Isfahan, an example of Iranian Squares known as maydan. In traditional Persian architecture, town squares are known as maydan or meydan. A maydan is considered as one of the essential features in urban planning and they are often adjacent to bazaars, large mosques and other public buildings. Naqsh-e Jahan Square in Isfahan and Azadi Square in Tehran are examples of classic and modern squares. Squares are often called "markt" because of the usage of the square as a market place. Almost every town in Belgium and the southern part of the Netherlands has a "Grote Markt" (for example "Grote Markt" in Brussels) or "Grand Place" in French. The "Grote Markt" is often the place where the town hall is situated and therefore the centre of the town. The same naming can be found in surrounding regions as for example Cologne has several central squares named "-markt" or "Markt" (Heumarkt, Neumarkt, Alter Markt). In Russia, central square (Russian: центра́льная пло́щадь, romanised: tsentráĺnaya plóshchad́) is a common term for an open area in the heart of the town. In a number of cities this square does not have an individual name, i.e., officially named so: Tsentráĺnaya Plóshchad́ (Central Square), e.g., Central Square (Tolyatti); see ru:Центральная площадь for more. Throughout Spain, Spanish America, and the Spanish East Indies, the plaza mayor of each center of administration held three closely related institutions: the cathedral, the cabildo or administrative center, which might be incorporated in a wing of a governor's palace, and the audiencia or law court. The plaza remains a center of community life that is only equaled by the market-place. This open space at the center of the cities is originally from the Mediterranean where public spaces always had very important role for public life. The origin of the word Plaza is, via Latin platea, from Greek πλατεῖα (ὁδός) plateia (hodos), meaning "broad (way or street)". The Plaza is the heir to the Roman "Forum", and this is the heir of the Greek (Agora). Most viceregal cities in Spanish America and the Philippines were planned around a square "plaza de armas", where troops could be mustered, as the name implies, surrounded by the governor's palace and the main church. Central Madrid Square or "Plaza" in Spanish language. In the United Kingdom, and especially in London and Edinburgh, a "square" has a wider meaning. There are public squares of the type described above but the term is also used for formal open spaces surrounded by houses with private gardens at the centre, sometimes known as garden squares. Most of these were built in the 18th and 19th centuries. In some cases the gardens are now open to the public. See the Squares in London category. Additionally, many public squares were created in towns and cities across the UK as part of urban redevelopment following the Blitz. Squares can also be quite small and resemble courtyards, especially in the City of London. In Halifax, the recently restored Piece Hall has been described a Piazza rivalling many in Europe. In some cities, especially in New England, the term "square" (as its Spanish equivalent, Plaza) is applied to a commercial area (like Central Square in Cambridge, Massachusetts), usually formed around the intersection of three or more streets, and which originally consisted of some open area (many of which have been filled in with traffic islands and other traffic calming features). Many of these intersections are irregular rather than square. In newer cities that have been planned mostly around the use of automobiles, public squares are rare and tend to be limited to the older central districts. The social utility of such public spaces can be severely curtailed by the high cost of downtown parking; at the same time, the high demand for parking has historically led to the proliferation of street-level parking lots which has further diminished the potential availability of open pedestrian space. Another deterrent is the perception of the urban core as a particularly dangerous crime center, whether the notion is justified or not. 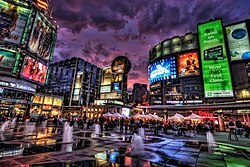 Throughout North America, words like place, square, or plaza frequently appear in the names of commercial developments such shopping centers and hotels. Wikimedia Commons has media related to Urban squares. ^ Boston University, "Boston English"
^ Piazza in the Oxford American Dictionary (2001). ^ "Boston squared". 2010-06-16. Retrieved 2013-07-30. Pitlane Magazine.com: "The Hidden Origin of the Town Square"
BBC.com: "The Violent History of Public Squares"
"This research initiative is an attempt to rediscover the lost or neglected urban symbols. The Urban Square is a city's 'heart and soul' and that is the focus of this project."